Cucumbers are exceptionally easy to grow. These prolific vines will reward even the mildest efforts with a bountiful harvest. Even gardeners without much space will find that cucumbers will thrive on fences and trellises, making them very accessible for almost anyone. There is a large variety of cucumber plants to choose from, each with its own distinct characteristics. Regular cucumbers are long, green, and firm. They are often used in salads or eaten raw. Pickling cucumbers mature in the short and stubby phase. Otherwise they resemble regular cucumbers. English cucumbers are long, thin, and typically have smaller, less prominent seeds. They are commonly used for vegetable trays and served raw as the skin is not as tough and can be left on. Cucumbers prefer a lot of sunlight and warm temperatures. The cucumber vine will spread quite a bit (up to 6 feet), so if you do not have much room in the garden it’s a good idea to grow them along a fence or trellis. Cucumbers can even be grown in pots when their vines are supported. Before planting, turn compost into the top six inches of the soil. 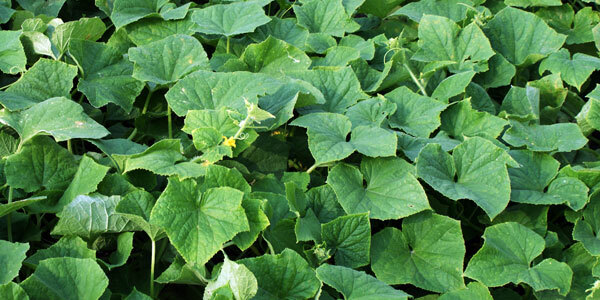 Well-rotted manure is ideal for meeting the needs of cucumbers. Soil should be well-drained. Amend clay soils with sand or loam to provide the proper drainage. Cucumbers are often planted in raised beds or on hills to allow for better drainage. This process also keeps the soil warmer which is preferable to cucumber plants. To increase the length of your growing season, start seeds indoors about six weeks before the last frost for your area. Use biodegradable peat pots that you can set directly into the garden so you won’t have to disturb their sensitive roots. Sow seeds or plant seedlings directly into the garden after danger of last frost. Follow the suggested spacing on the package for the variety you are planting. Once seedlings have two leaves each, thin them to the one or two strongest plants per hill. With just a bit of maintenance, you’ll have a bounty of cucumbers in no time! Water plants weekly. The cucumber fruit is composed of quite a bit of moisture and needs ample water supply to properly grow. Keep beds well weeded. Weeds compete with the plants for valuable nutrition. Applying mulch around the plants will help keep weeds at a minimum while helping to maintain moisture levels. Pick cucumbers as soon as they reach a mature size for the specific variety. It is best to remove the cucumbers by either cutting them off or twisting and pulling to remove them from the plant. The more often you pick cucumbers, the more your plant will produce. If you wish to “train” your cucumbers to a fence, trellis, or even to a particular portion of your yard or garden, tend to the plant daily. Cucumbers set down secondary roots as they grow and the plant will wilt when these roots are disturbed. If you need to move a vine, do so carefully and water the plant afterwards, especially if the ground is dry. Avoid wetting the leaves when possible. Water the roots of the plant instead. Cucumber plants have both male and female flowers, with the female flowers producing. To increase production, pollinate the flowers by using a cotton swab to transfer pollen from the male flower to the female flower. If cucumbers wreak havoc on your digestive system, try the Burpless variety. Hello All, I just have one question. How can you tell the female flower from the male. Hi Des – Haven’t tried cukes yet but I would imagine they’re similar to gourds. The female flower will have a bit of a bulb where it attaches to the stem and the male will not. Since I have limited space, I plan to build a trellis out of PVC pipe to grow the cukes on. Think it will work. Any comments? I am growing a F1 female cucumber and they have grown really long but they are very thin is this right or should i wait for them to fill out before picking them? It may be that the plant tendrils require a more textured surface than PVC pipe in order to be securely fastened to the trellis (?) but perhaps not. Have not tried that particular approach, but wooden trellis remains tried and true…have fun! when using pvc for frame i inserted small nail and wove “baler twine” to frame. also use netting purchase at local hardware store.